The Combined Brath and Ham Families wish to express our deep gratitude to the Sunnyside Church for all the love you showed to our mother, Bea, during her final illness. Your continued visits, cards, prayers, and loving thoughts meant so much to her. And we, her children, are so grateful to you for helping in countless ways with her memorial service on October 28. The attention to detail by so many–deacons and deaconesses, P.A. and video crews, musicians, office coordinator, elders, pastors, janitors, landscape crew, and especially the amazing food preparation crew–all of you and many more worked so hard to make the service an honor both to Bea and to her wonderful God. Thank you, too, for the flowers, cards, prayers, and kind words of sympathy and happy memories that you shared with us. We look forward to “Gathering at the River” with you and our beloved Nana Bea in the Resurrection. On Behalf of the Evanado, Strobehn and Simmon families, we are thanking all the church staff and members for their kindness, accommodations, and services rendered that made the memorial service of our beloved Christopher Strobehn a memorable one. Goodbye from Larry and Caroline Wrightman. We are sad to bid you adieu. We are moving to Hesperia, Calif. in order to be closer to several family members. After moving to Portland in 1987, Sunnyside became our first church family. During the years of 1997 to 2007 we visited other church homes. But the warmth and friendliness of Sunnyside drew us back. Thanks to everyone who has shared a part of themselves with us. We will miss you. Thank you, our church family, for the incredible support with the Adventurers’ Induction & Fundraiser. Children, parents, and teachers were busy creating a beautiful event: decorations by Little Lambs; greeting by Eager Beavers; cooking by Busy Bees and their hard working Romanian friends; Sunbeams provided music and entertainment; Builders worked hard in the Fundraising duties and Helping Hands assisted in the devotional and a very well done skit! We’d like to thank Gene & Judy Denis, grandma Lorrie & Lloyd Wescott, Ruby & Bill Hohense for their help and support, the Russell family for the sweet song, Pastor Shirley for the beautiful ceremony, shopping enthusiastically and washing the dishes, Dave Allen for making it a “Not-That-Silent” silent auction, and to our very many and generous donors (Helen Ferrier, Carl & Rose Buchanan, Joan Fenn and others) that brought in items for us to sell! And then, they donated more, by shopping! Thanks to many of our friends that shopped generously, we are not only $1,371 richer, but we’ve been blessed to see the support of our church family! We are so thankful this thanksgiving season!!! May God bless you! Turkey Trot / Tot Trot At The Zoo, Thanksgiving morning, November 22, 8 am, at Washington Park. Advance sign up not required. Runners, walkers, toddlers and strollers. Begins at Forestry Center ends at elephant exhibit in the zoo. For more information contact Arnold Petersen. View details at http://goo.gl/MYjxf. Childrens Church November 10, 11:15 am. All kids ages 4-14 welcome! 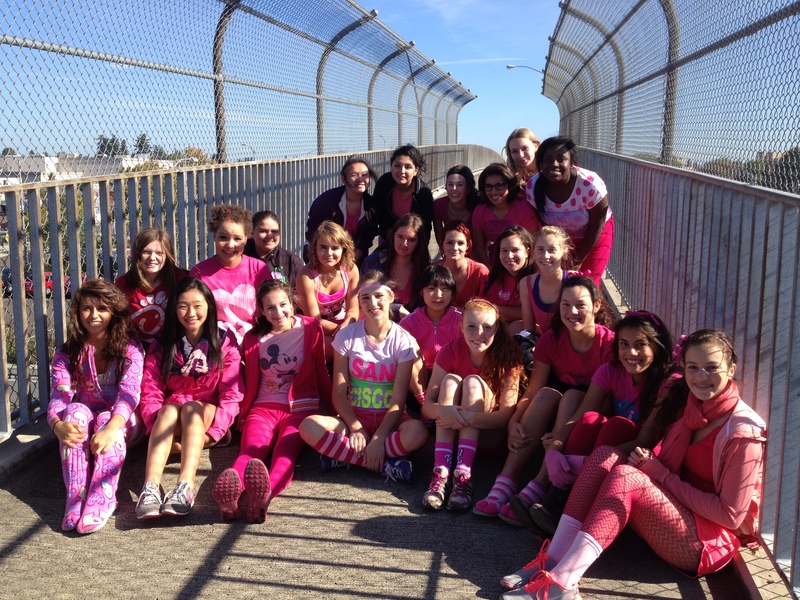 On October 17, a happy crowd of PAA girls, dressed head-to-toe in pink, walked and waved to all who passed them along the busy roads of PAA’s neighborhood. Their leader was PAA’s Ladies Health and P.E. teacher, Linda Johnson, who has a passion for breast cancer awareness and for inspiring her students and others to live an active life no matter what their age or ability. The Pink Walk is significant to PAA. Kathryn Damazo, a PAA Girls’ P.E. teacher died of breast cancer in 2004. The PAA community remembers her every year when they grant a student with a Kathryn Damazo Scholarship Award. Linda’s students remember Damazo every October. Read more at PAA’s new e-Headlines: http://goo.gl/YyWau. Hurricane Sandy has left millions of people with needs ranging from food and water to personal care items, cleaning supplies, shelter, and much more. Trained Adventist Community Services Disaster Response (ACS DR) volunteers up and down the east coast of the United States are hard at work providing emergency and recovery assistance in Christ’s name. With your help, they can do much more. ACS DR is a well-respected disaster response leader that can leverage partnerships and make bulk purchases that can multiply the benefits of your donated dollars. Please consider making a donation to ACS DR and help your church make a difference in the lives of those impacted by Hurricane Sandy. Ways to give include: Drop a donation in your local church offering plate marked “ACS Disaster Response”; Go to www.communityservices.org; call 800-381-7171; Mail a check to ACS Disaster Response, 12501 Old Columbia Pike, Silver Spring, MD 20904. Today, 4 pm, Vancouver Church will host the Oregon Adventist Men’s Chorus’ celebration of their South Africa mission project. Special guests from South Africa as well as Faith for Today’s Dan Matthews join OAMC in sharing exciting stories of God’s leading. You may also join the celebration online with live streaming at www.oamc.org/livestream.asp. The CD “Arise O Man, the 2012 Brotherhood Tour—South Africa” will be released today in conjunction with the OAMC concert. It is available at the concert, www.faithfortoday.tv, www.oamc.org, and www.sabbathtimemusic.com. November 12, 10 am, Rivergate Adventist Elementary cordially invites you to join us for our Veterans Day Program to be held in the school gym where we will honor those who have served and continue to serve for our daily freedoms. If you know an active service person or a vet, please invite them to join you for our program. If you are bringing a service person and you can let us know in advance, we would appreciate their information. We create honorary stars to line our wall and we would like to include their information as well. You may contact the school office at 503-656-0544 or cambra@rgsda.org. December 9, 7 pm, Bend Adventist Church hosts Fountainview Academy Orchestra & Choir Concert. Don’t miss these talented young musicians as they present the gospel through music during this year’s Christmas tour. Donations accepted in lieu of admission. For more information view www.fountainofmusic.ca or email jandjkass@hotmail.com.